Introduction:Laparoscopic nephrectomy is replacing open radical nephrectomy as the standard of care and it can be performed by a transperitoneal and retoperitoneal approach.Data remain scanty as to whether any objective difference exists between the two approaches.NOTES may shift the decisional paradigm between the two techniques.In the attempt to establish the best way to approach the kidney, the feasibility of right nephrectomy was assessed by 3 different NOTES approaches:trangastric transperitoneal, transvaginal transperitoneal and transvaginal retroperitoneal. Materials and Methods:The procedures were performed under general anaesthesia in three 30-35kg female pigs.For transgastric nephrectomy, with the pig supine, the peritoneal cavity was entered with a double channel endoscope(Storz™)through a 1.5 cm gastrotomy.The pig was then tilted on a left later decubitus and the dissection of the kidney initiated with a lateral to medial approach opening the posterior peritoneal attachments with progressive isolation of the renal pedicle. For transvaginal transperitoneal nephrectomy,the endoscope was introduced into the peritoneal cavity through a full-thickness posterior colpotomy.After swithching from supine to a left decubitus, the mobilization of the kidney begun at its upper-medial surface and extended towards the hilum.The anterior and inferior aspect of the specimen were mobilized from the underside of the peritoneal envelope.For retroperitoneal transvaginal nephrectomy the retroperitoneum was entered through a postero-lateral colpotomy with preservation of the peritoneal sheet.A retroperitoneal tunnel was subsequently created with endoscopic blunt dissection up to the renal vessels. Results:Transperitoneal NOTES nephrectomy is feasible in the porcine model by all the described techniques.Nevertheless when using transgastric and transvaginal transperitoneal approaches, the bulk of the kidney becomes a significant issue complicating the exposure with resultant cumbersome and time consuming(90min and 70min respectively)procedures.Retroperitoneal transvaginal nephrectomy permits a sequential dissection of the anatomical planes with expeditious access to the renal artery and vein and contained operative time (45 min). 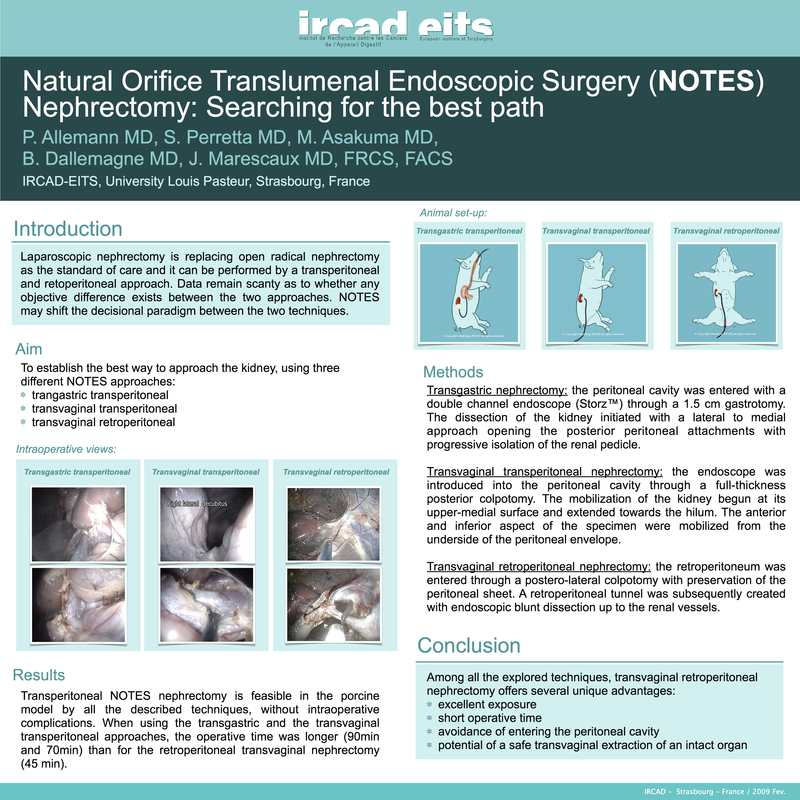 Conclusions:Among all the explored techniques,transvaginal retroperitoneoal nephrectomy offers several unique advantages such as excellent exposure,short operative time and the potential,of a safe tranvaginal extraction of an intact organ.